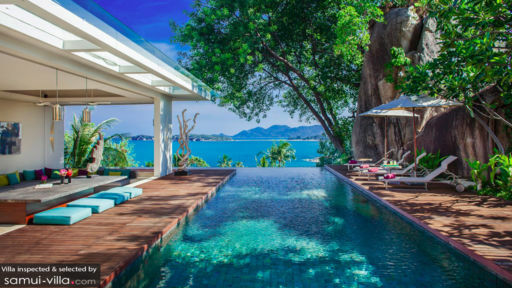 Built atop a natural rock formations, Villa Hin or ‘The Rock House’ is a unique holiday villa that instantly reminds one of a tropical home overlooking the bay as it is ideally situated near the coastline of Choeng Mon beach, Samui. With five bedrooms, the villa is idyllic with excellent landscaping that encompasses water bodies with pebbles, tropical plants, and flowers blooming in the warm weather. A swimming pool nestled between a timber pool deck extends out to meet the ocean giving you an infinity pool vibe. Relax on the alfresco lounge area or the terrace living space for panoramic views along with a glass of wine! Villa Hin is home to five splendid bedrooms that either open out to the ocean or provide memorable views of the villa gardens. Each bedroom is modern, elegant in décor and style with king-sized beds that hover over the floors. Wooden panels grace the back wall and large windows ensure a stunning vista as soon as you’re awake! The air-conditioned bedrooms are perfect for a good night’s rest, just what you need to de-stress and relax! You may find a porch or balcony in some of the rooms with outdoor, garden chairs for lounging. En-suite bathrooms accompany the bedrooms for convenience, and each of them has been fitted with modern amenities such as walk-in showers, basins, bathrobes, toiletries, and others. Villa Hin is one that embraces its natural surroundings much more than any other as you will find ample space for you to enjoy the sun while basking in the tropical breeze. The 14-metre swimming pool sports an infinity edge to maximise the impact of being so close to ocean you could almost touch it! The pool deck runs across three sides and has lounge chairs for sunbathing and relaxing. On the terrace, there is a gorgeous sitting area with comfortable couches that provide an even more delectable view of the spectacular coastline! 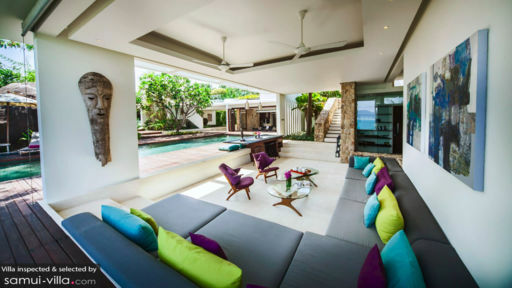 Just off the swimming pool, lies the open-concept living area at Villa Hin that has been furnished with a comfortable, L-shaped sofa accented by vibrant cushions. The beautifully-decorated space features artwork donning the walls, and ceiling fans that air out the space even further. With abundant natural lighting and the fresh breeze flooding the living room, everyone can enjoy a pleasant time while chatting away, relishing appetizers, and binging on some selective wine! Overlooking the swimming pool through glass windows that can be left open for the tropical breeze, the dining area is another bright and cheerful room at the villa. With an eight-seater dining table set facing the splendid view, you can rest assured that each meal is going to better than its predecessor. A fully-equipped, western kitchen with a modern hob and other amenities is also at your disposal, perfect for all your culinary requirements. 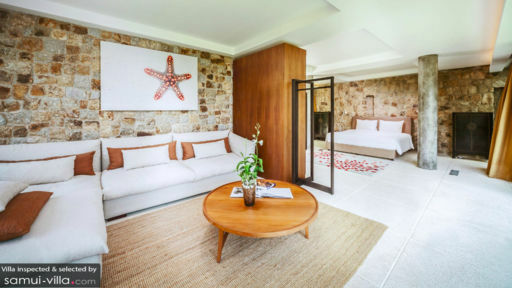 Offering personal guest assistance along with housekeeping and upkeep, the villa makes sure to deliver the best service and assistance to guests. There is 24-hour security so you have not a thing to worry about. Upon request, the staff can arrange for a personal chef to prepare scrumptious meals for everyone! Car rentals with chauffeur are available if you wish, and in-house massages can be arranged for an extra cost. Located right on the coast of Choeng Mong beach, the villa is a haven for beach lovers as you can simply walk down to dig your toes in the sand and feel the water lap around you. The beautiful weather is just the perfect addition to an idyllic holiday. You can lounge or head to one of the beachside restaurants for some local delights. Absolutely gorgeous Villa with spectacular views of the coastline. The Villa itself is built around a natural rock formation and compliments the living space. Plenty of private areas to lounge and soak up of the sun. Daily breakfast was amazing and the kitchen staff was more than accommodating to prepare our spectacular meals.